GREEK INVENTION PROMISES INEXHAUSTIBLE ENERGY FROM WATER! 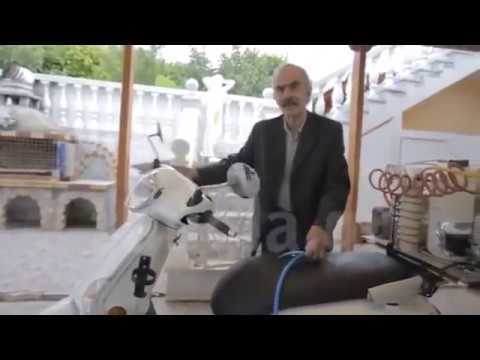 Greek inventor and electronic engineer Petros Zografos presents here an application of his patented method for oscillatory pulse catalytic hydrogen (HHO) extraction from seawater to be used as fuel. A miniaturized model of his generator is adjusted onto a motorbike, without modifying the existing engine, and HHO is fed into the internal carburettor from a plastic tube. Note that the driver does never touch his right hand on the wheel gas socket, but only uses it to rudimentary regulate the flow of hydrogen from the device into the engine. Under direct video recording, the motorbike travels about 10 kilometres along a scenic seaside highway, having consumed only a small fraction of the water in the tank. The inventor explains that mass production of his invention will insert in motorcycles only a small box, 30 cm x 30 cm, and not this large prototype he uses in the video demonstration. A device that generates clean electricity from water and high frequencies is developed by a Greek inventor Peter Zografos. The Union of Greek Physicists held a special scientific conference for the presentation of the invention. The general belief of the scientists is that the invention is a particularly interesting innovation worldwide, which should be promoted. During the conference there were questions about the social dimension of the invention and whether it can contribute to addressing the energy problem of Greece. The next ten days, the Union of Greek Physicists will establish a special committee, which will be composed by five distinguished scientists who will undertake to assess the device and check its results. Then the results of this evaluation will be published in international scientific journals. If you would like to share this blog story on Facebook with one easy click, scroll down to the very bottom of this page and look for the SHARE button along with the Facebook LIKE button under the "Sign up to Learn About & Help End Global Warming" area where people enter their email address. You do not need to enter any email address to use the one click SHARE button.